Follow my instrutions for normal google accounts, but you need to follow the steps below after creating the account on the iphoneto configure multiple calendars. 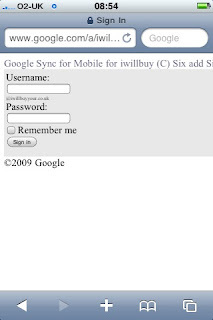 If you only have one calendar then you dont necessarilyy need to do this other than to verify the admin for your domain has enabled sync services. 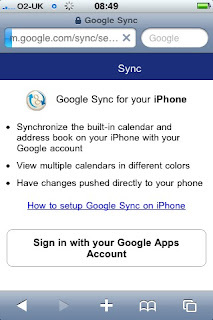 Sync is by default turned off for google apps accounts. It can be turned on by following these instructions, then follow the steps here to add/manage the calendars that are synced. If you prefer, jump to the shortcut tip at the end! 1. 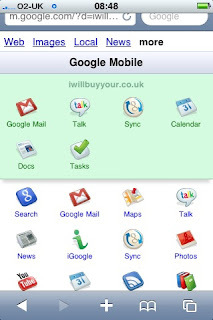 On your iphone goto use Safari and goto http://m.google.com/ and scroll down to the box "Google Apps user" tap to configure your domain. In the pop up box enter your full domain name. If you want to enter the above address in Safari on your iphone replacing yourdomainname.co.uk with yep, your domain name.